Discussion in 'Wireless Article Discussions' started by thiggins, Jun 15, 2017. Test results and ranking are up. Review to follow shortly. That's a pretty significant improvement over the RT and the R7000. Can't wait to read the review. Whoa, you're showing USB write speeds wayyyy faster than I'm seeing. I've only gotten 15MB/s max. How did you test those? edit: Wait, on the summary page it says Mb/s but the USB results pages say MB/s.. Which is it? Wait, on the summary page it says Mb/s but the USB results pages say MB/s.. Which is it? Also, this quote from the review seems strange: "There is obviously still something wrong with the GT-AC5300's USB 3.0 connection, given it yielded only 31 MB/s write and 34 MB/s read. But whatever's wrong with the RT has been solved with the GT, since it produces much higher throughput." Should it read "...still something wrong with the RT-AC5300's USB"? One thing I would add to the review: the beefier CPU might come in handy for anyone who runs a VPN (server or client) on the router, and have a fast Internet connection. So if one has to chose between the RT-AC5300 and the GT-AC5300, this can be an important factor if your Internet connection is faster than 60 Mbps. Yes it should. Thanks for the catch. Corrected. Even though its not as powerful as the Alpine, being an A53 low power part probably means it runs much cooler, and probably can run at peak performance longer when under high CPU load. The Alpine is like an oven. I would second that thought. My brother has a gigabit connection from his ISP and this router is the first that doesn't tax the router's CPU when routing near his bandwidth limit. Storage results are MB/s. Test process is described here. The legend is incorrect; there are many units mixed. I will correct this. Your review said Rev 1.411 is the GT-ac5300 but that shows 512MBx 1, the Rev 1.311 which shows 512MBx2 which would be the 1 gig of memory the router has. I'm confused. Benchmark summary units are fixed. Sorry for the problem. I was too. That's why I opened it up and took pictures to confirm 1 GB . That CPU also has the potential to reach pretty high performance levels with VPN, as it contains an AES crypto engine, so it's not just about the increase in clock speed or IPC. I don't know however if Asus leverages it in their firmware. cybrnook, Makaveli and avtella like this. Hm, were you able to confirm/measure 802.3ad functionality? It's non-functional on my unit. 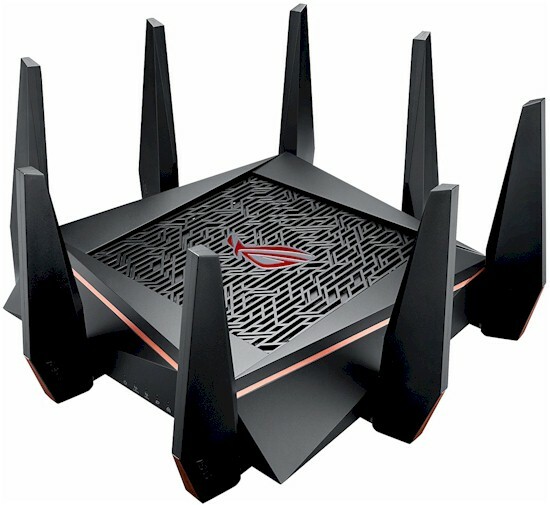 There is no ad functionality on this router. There is in the Netgear X10 (runs great on dd-wtr) and one other router I can't remember the name of. John, I don't think many people even have "802.11 ad" devices let alone the fact that it's not very useful outside of the very room the router is placed in. 802.3ad is link aggregation. 802.11ad is 60 GHz WiGig. I did not test link aggregation. It is useful only to create a higher bandwidth connection for use with multiple devices, such as multiple computers streaming from a NAS. However at this price point I think you are better off building your own. As Merlin mentioned I am curious to see what VPN performance is like on this thing. I think you are confusing 802.11ad with 802.3ad. Some people are saying that even the router doesn't even have 802.3ad. I think it does, but I don't know how to definitively test it.